Every four years you get an extra 24 hours to be awesome. Today is that day, my friend – so don’t screw this up. If it’s your birthday, Vegas is really bending over backwards to make it up to you. There’s no easy way to put this, but you look pretty freakin’ old for your age so we’re going the extra mile to be nice and make you feel really special. Check out our list of things to do to get a jump start on your own Leap Day itinerary. 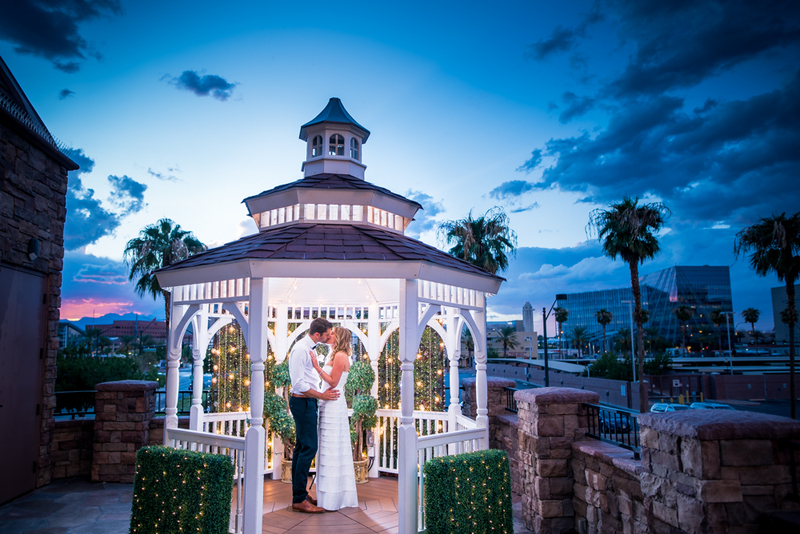 Photo courtesy of Vegas Weddings. What couple doesn’t want to have to remember their wedding anniversary once every four years? Leap day is a wildly popular day to get married and there are so many places to swap vows (and spit) in the wedding capital of the world. Vegas Wedding chapels like THE Wedding Chapel, Hawaiian Gardens and The Wedding Garden and more will see an average of 650 people on Leap Day. It takes all hands on deck for specialty dates like this, around 70 employees to run the operation and close to 700 roses for bouquets and décor. That’s kind of like botanical genocide, if you think about it. JK, we’re not using our extra time to get all Negative Nancy, and you shouldn’t either. Photo courtesy of Ashley Oñoz-Wright/Vegas.com. The Blarney Stone, which is more like a chunk if we’re being honest, was passed on to The D from the long-lost Irish-themed hotel, Fitzgeralds. 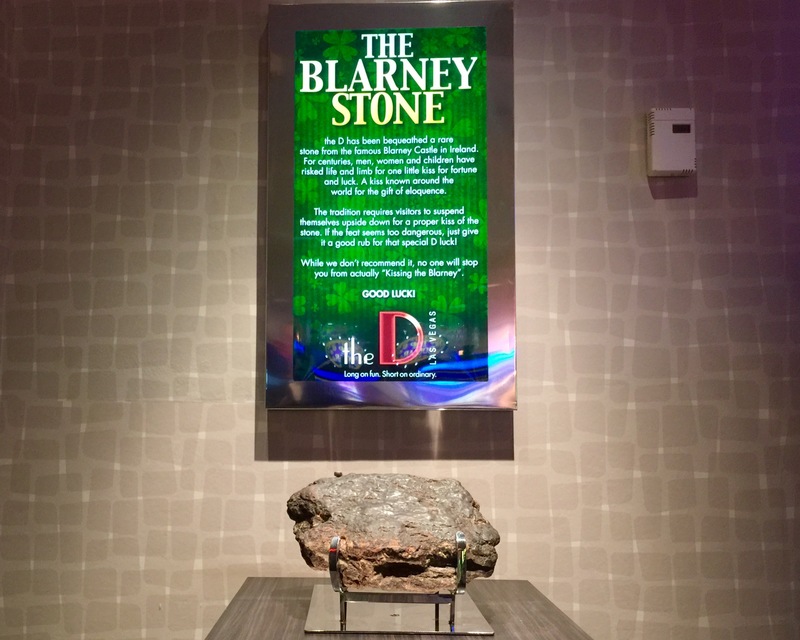 You may have heard of the famous stone, but you probably didn’t know we had a piece that was brought over from the real Blarney Castle in Ireland. Just please don’t kiss this one for luck. While we can’t be sure anyone has ever whizzed all over it for a good laugh, we can’t be sure someone hasn’t. Best to air on the side of sanitation and rub with your hands. You like big butts and you cannot lie? No problem. The tight bronze buns on the Crazy Girls statue at Planet Hollywood are some of the most photographed derrieres in Vegas, and rumor has it – one of the luckiest statues in town. Thousands of people have gotten handsy for the sake of Lady Luck accompanying them at the tables. Photo courtesy of SkyJump Las Vegas. Spend this extra day conquering your fear of heights and earn a ton of street cred on SkyJump Las Vegas at the Stratosphere. After suiting up in the harness, you’ll take an elevator to the 108th floor of the tallest building this side of the old Mississippi, and probably start sweating bullets. If ever there was a time for a leap of faith, it’s now (badump bump). 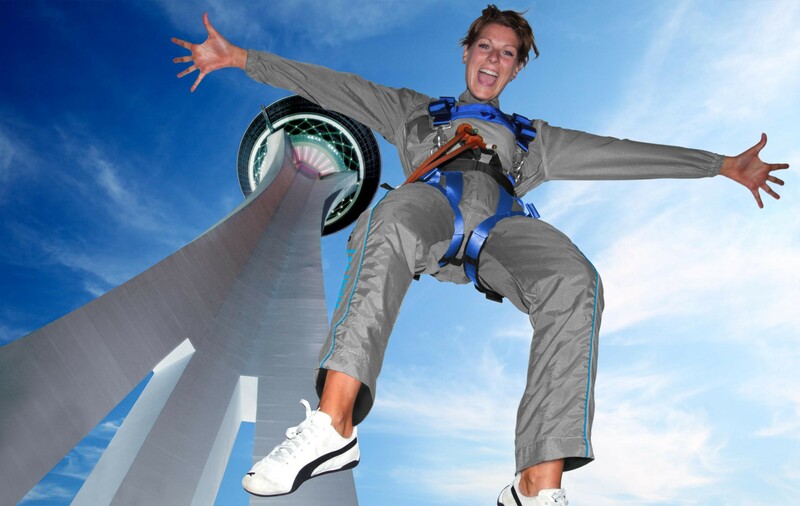 Then, you’ll step off a platform 855 feet high above the Las Vegas Strip on a controlled free fall that will probably evoke a colorful array of profanity. On Leap Day, all jumps are 50 percent off. Photo courtesy of Qua Baths & Spa. We all know what it feels like to wish we had an extra day of sleep. 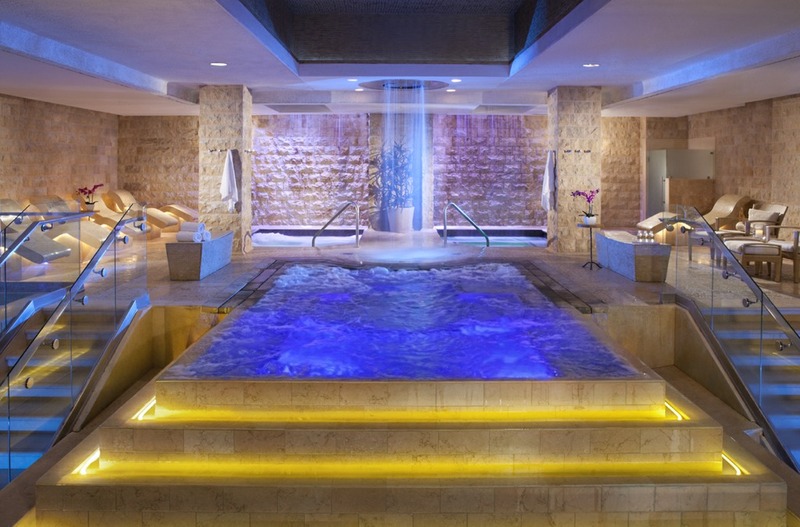 But if a little R&R is what you need today, check out our list of the top five Vegas spas to melt away the stresses of grocery lists, Post-Its, or just plain demonic children. From the falling snow room at Qua Baths & Spa to the heated lounge chairs at The Spa at Encore, we’ve pretty much written the book on how to pamper yourself in the most unique and indulgent ways possible. Go ahead, take advantage of them. Is a poolside retreat more your style? With temperatures already in the low 80s, the only ice we’re experiencing these days is swirling around in our margarita glasses by the pool. We probably invented the idea of indoor/outdoor living and there’s no better place to witness it in all its glory than the pools that are open year round. That’s right, you could be lying by the pool as you’re reading this. Why are you waiting again? Is it your birthday? Well since you only get to celebrate your actual birth date every four years, you might as well score some free grub. The Hard Rock Café has a list of menu items for Leaplings like burgers, mac & cheese, pulled pork and chicken sandwiches and more that are FREE because you’re so special. Looking for a big bowl of pasta to stand up against all those birthday drinks? Buca di Beppo wants to give you free spaghetti and meatballs. 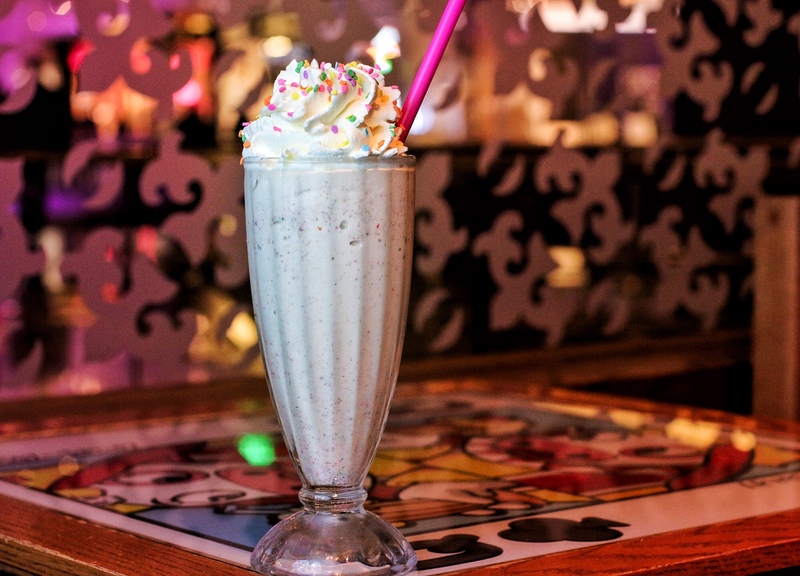 At Holsteins Shakes and Buns inside The Cosmopolitan of Las Vegas, you can grub on the Classic Burger and a Birthday Cake Bam-Boozled milkshake. See, look how much people are making it up to you. When you’re done with your meal, head over to Sprinkles for desert. They’re offering four free cupcakes to Leaplings to make up for every year you got the shaft. Check out more things to do in Vegas.